This book should be of interest to those who had relatives working on the sugar plantations in Hawaii. 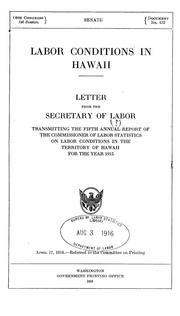 “Labor Conditions in Hawaii: a Letter from the Secretary of Labor transmitting the fifth annual report of the Commission of Labor Statistics on Labor Conditions in the Territory of Hawaii for the Year 1915”. Washington : Government Printing Office, 1916. This is a report from the Labor Department on conditions at Hawaii’s plantations. It has some pretty interesting information of work conditions. It also includes charts on wages and pay which might be of interest. Those wages are broken down by occupation and race. The book is available for download through openlibrary.org in several formats.